In The History Manifesto, historians Jo Guldi, the Hans Rothfels Assistant Professor of History at Brown, and David Armitage, the Lloyd C. Blankfein Professor of History and Chair of the History Department at Harvard, repeatedly misunderstand or misrepresent the research they disparagingly cite in their references — especially the research of economists and economic historians. In fact, the footnotes (technically endnotes) in the book often bear no relation to the authors’ contentions and, in a few cases, state the exact opposite of what G & A claim their sources say. One begins to wonder, have they actually read any of the references they cite ? The critique touches on many issues along the way, including Victorian inequality, the environment & economics, etc. Guldi criticises many non-historian researchers in this 125-page monograph with 300+ notes, but she reserves a special animus against economists and economic historians. In the narrative she constructs, broad-minded historians work with fuller, richer, multi-faceted evidence to come up with a balanced view of the past, whilst doctrinaire, myth-driven economists form Panglossian interpretations of narrow, reductionist data. By Guldi’s own description, pages 57-60 of the book, which deal with the divergent views of historians and economists on the subject of inequality and living standards in 19th century Britain, is the showcase exhibit in the contrast between the two groups. But in this section errors, distortions, and misrepresentations of research are particularly dense, and Guldi’s narrative is eviscerated by their exposure. So I start the examination of G&A’s references with this section. Edit 18 March 2015: In light of the revisions made to The History Manifesto, I link to the screenshots of the original citations from the original PDF version of the book, where appropriate. See end of post for more details. The exact opposite of what the source said ! [G&A pg 57] There are few brighter examples of reductionism and its opposite than the debates over inequality in Victorian Britain… The Victorian period has been researched and written about in both History and Economics departments as a major concentration of the field. Yet the two fields could not disagree more about what happened. Each measures a single index or perhaps compares to indices of well-being: criminality and height; education and wealth at death; migration and wages. Based upon these data, the economists conclude that the nineteenth century led to gains in equality, opportunity, and nutrition. 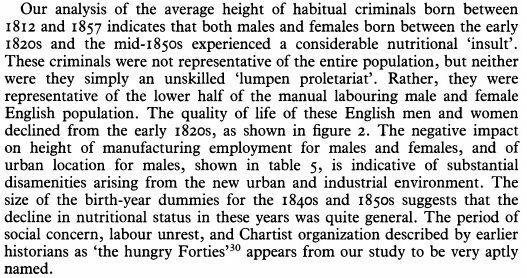 60 Johnson and Nicholas, ‘Male and Female Living Standards in England and Wales, 1812–1867’, [The Economic History Review 48 (1995)], 470–81. The experience of health deteriorated in the nineteenth century. The downward trend in infant and child mortality in the 1710s–1810s was reversed in the 1820s– 30s, with some improvement in the 1870s and 1880s, before a more decisive decline in the twentieth century (Wrigley et al. 1997 : 215; Mitchell 1988 : 57– 8; Millward and Bell 2001 : 699; Huck 1995 ). [G&A pg 58] Among economic historians dealing with inequality over the nineteenth century, a surprising number conclude that nineteenth-century industrialisation resulted in more nutrition for the poor, while twentieth-century ‘socialism’ resulted in higher taxes and stagnating social opportunity.54 According to economists, these numbers demonstrate conclusively that capitalism banished inequality during the nineteenth century, and could do so again. 54 Paul Johnson and Stephen Nicholas, ‘Male and Female Living Standards in England and Wales, 1812–1867: Evidence from Criminal Height Records’, The Economic History Review 48 (1995), 470–81; Joel Mokyr, The Gifts of Athena: Historical Origins of the Knowledge Economy (Princeton, NJ, 2002); Jason Long, ‘Rural–Urban Migration and Socioeconomic Mobility in Victorian Britain’, The Journal of Economic History 65 (2005), 1–35; Jason Long, ‘The Surprising Social Mobility of Victorian Britain’, European Review of Economic History 17 (2013), 1–23. Nobody cited in note 54 says or implies anything about socialism, higher taxes, or “stagnating social opportunity” in 20th century Britain. This is simply a case of hallucinated subtext. And he is supposed to be a prominent representative of a species who fixates on a narrow metric of well-being and pronounces all is peachy ! As for health and nutrition, it would take too long to summarise Chapter 5 of Gifts, but no fair-minded person reading that complicated portrait of changes in public health, nutritional knowledge, household behaviour, and technology, could come away thinking Mokyr displays simplistic optimism. He does mention that despite the general decline in mortality, the infant and child mortality rates in 1900 were about the same as in 1850. Long finds the above surprising because over the same period Britain, at first a laggard in supplying public education, converged with other western countries. So you can interpret that to mean, either there was as much opportunity in 19th century Britain as there was in 20th century Britain (at least in income terms), or equally little in both. I don’t understand what problem Guldi has with Long 2005, a dry yeoman-like study of whether rural migrants to the city in Victorian Britain earned more than if they had stayed in the countryside, and if they were more likely to experience greater intergenerational mobility. There is one sentence in which Long mentions the 19th century did not have welfare programmes like the 20th to inhibit geographical mobility. Maybe this one sentence burgeoned like a Triffid in Guldi’s mind and transformed into “twentieth-century ‘socialism’ resulted in higher taxes and stagnating social opportunity” ??? References have nothing to do with claim in text ! 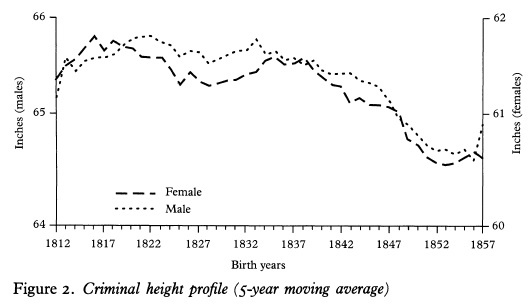 59 Johnson and Nicholas, ‘Male and Female Living Standards in England and Wales, 1812–1867’, 470–81; Robert J. Barro, ‘Democracy and Growth’, Journal of Economic Growth 1 (1996), 1–27; Jakob B. Madsen, James B. Ang, and Rajabrata Banerjee, ‘Four Centuries of British Economic Growth: The Roles of Technology and Population’, Journal of Economic Growth 15 (2010), 263–90; Morgan Kelly and Cormac Ó Gráda, ‘Numerare Est Errare: Agricultural Output and Food Supply in England Before and During the Industrial Revolution’, The Journal of Economic History 73 (2013), 1132–63. Johnson & Nicholas, the gift that keeps on giving ! 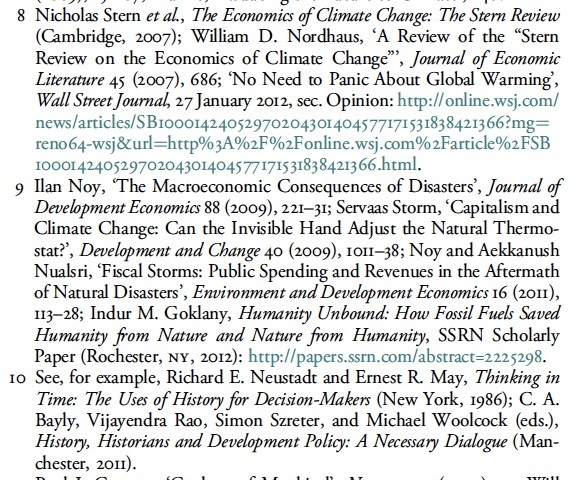 The other references are equally cited for no reason. Barro 1996, a very famous paper, explores whether democracy induces economic growth. It certainly does not interpret one as a proxy for the other. Madsen et al. 2010 test various theoretical models of the British industrial revolution and conclude that the number of inventors and the fall in population growth are the biggest explanatory factors. Kelly & Ó Gráda 2013 disputes previous estimates of agricultural output and food availability in 1200-1800 and discuss the implications of their own estimates for the nutritional status of the preindustrial English population. [Edit: Kelly & Ó Gráda’s discussion does cover nutritional status in the 19th century as well.] All of them stay very close to their technical tasks and are not particularly romantic about what their results mean. None of the papers cited has anything to do with using wages, prices, or height as proxies for freedom, democracy, or happiness ! 61 Sara Horrell, David Meredith, and Deborah Oxley, ‘Measuring Misery: Body Mass, Ageing and Gender Inequality in Victorian London’, Explorations in Economic History 46 (2009), 93–119; Sébastien Rioux, ‘Capitalism and the Production of Uneven Bodies: Women, Motherhood and Food Distribution in Britain c. 1850–1914’, Transactions of the Institute of British Geographers, (2014): doi:10.1111/tran.12063. 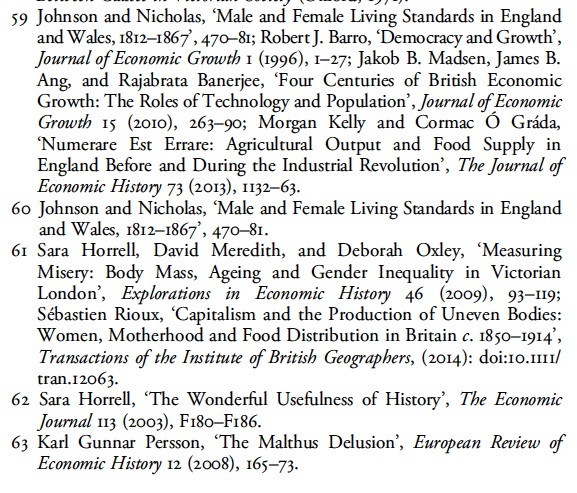 62 Sara Horrell, ‘The Wonderful Usefulness of History’, The Economic Journal 113 (2003), F180–F186. According to Horrell et al. 2009, in their very large sample of prisoners, women gained weight in prison, but men generally lost, suggesting that life outside prison was harder for lower-class women than for men. But other representations by Guldi’s are simply incorrect. (a) Horrell et al. were not countering poor Johnson & Nicholas, for the latter also reported (thankless) evidence of greater “nutritional insult” for women than for men !!! (b) Horrell et al. were not “reconsidering” the data from the punching bags J & N, because the two studies used completely different prison populations and different time periods ! (c) The first page of Horrell et al. summarises the previous theoretical and empirical findings on the different experiences of men and women during the Industrial Revolution — completely contrary to Guldi’s claim that disciplinary prejudices had prevented economic historians from noticing ! (d) Sara Horrell does not attribute her “sensitivity” to reading the “historians of the Short Past”. That’s just made up by Guldi. In her review (Horrell 2003) of The Cambridge Economic History of the United States, Horrell appropriates the phrase “the wonderful usefulness of history” from Deirdre McCloskey which is a very general praise of historical information. When Guldi cites an actual wage optimist, she gets the crucial detail all wrong ! 57 Philip T. Hoffman et al., ‘Real Inequality in Europe Since 1500’, The Journal of Economic History 62 (2002), 322–55. 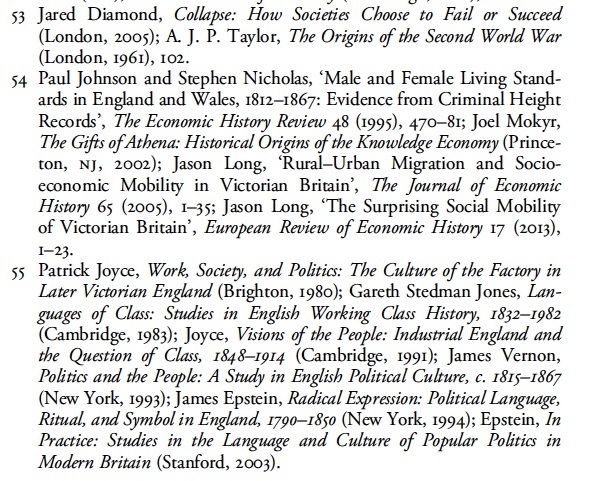 58 Gareth Stedman Jones, Outcast London: A Study in the Relationship Between Classes in Victorian Society (Oxford, 1971). The changes in inequality over time obviously can’t be explained exclusively by the difference in real and nominal values of inequality (i.e., by purchasing power), and Hoffman et al. do not claim otherwise. The paper is primarily about the period 1500-1800, when, the authors argue, the rising prices of staple goods for the poor worsened income inequality for the lower classes in real terms. I’ve shown that Guldi’s pp 57-60 are a mine-field of errors and distortions. Now I examine other parts of the book. 43 David Landes, The Unbound Prometheus: Technological Change and Industrial Development in Western Europe from 1750 to the Present (London, 1969); William J. Ashworth, ‘The British Industrial Revolution and the Ideological Revolution: Science, Neoliberalism and History’, History of Science (2014): doi: 10.1177/0073275314529860. The idea that Landes conceived his classic book on the Industrial Revolution in “direct support of Green Revolution policies” is substantiated neither in the book itself, nor in the Ashworth reference. Landes is a neo-Weberian who extols the primacy of culture in economic development and, in the particular case of Europe, the primacy of Protestant culture. Ashworth criticises him as part of a neoliberal tradition, including Hayek, which minimises the role of the state and maximises that of the innovative individual in the history of the industrial revolution. It’s very ironic. Guldi routinely portrays economists as neoliberal freaks, but then when she stumbles on the one historian who happens to be a neoliberal, it goes unnoticed. Maybe she mistook Landes for Norman Borlaug ? [G&A pg 63] To counter the claims of climate scientists about rising CO2 and a changing climate that merited immediate action, some economists proposed their own version of past and future, one that emphasised continuous technological innovation and economic growth since 1700, and proposed that no matter what dangers had recently been revealed by climate science, the invisible hand of the market would take care of them.9 Neither side really substantiated their claims by taking into account the others. Instead, both sides had mutually irreconcilable models of the past based on limited data of their own. The papers by Noy 2009 and Noy & Nuaslri 2011 are about the economic impact of natural disasters, like hurricanes and earthquakes, or the fiscal behaviours of governments in the aftermath. They have absolutely nothing to do with technology and growth magically taking care of climate change !!! They don’t even mention climate change ! Storm (2009) summarises a panel discussion all of whose participants agreed that “capitalism’s institutions have to be drastically reformed and made fundamentally more equitable“. Even Goklany, a publication from the libertarian Cato Institute, argues, not that the free market will take care of climate change, but that climate change is not a problem which needs solving, because the net benefits of fossil fuels are far greater. 17 Anil Markandya, ‘Can Climate Change Be Reversed under Capitalism?’, Development and Change 40 (2009), 1141. 18 Kenneth Arrow et al., ‘Economic Growth, Carrying Capacity, and the Environment’, Ecological Economics15 (1995), 91–5; David I.Stern and Michael S. Common, ‘Is There an Environmental Kuznets Curve for Sulfur?’, Journal of Environmental Economics and Management 41 (2001), 162–78. 19 Historians of Germany have documented a crisis in wood that spread through early-modern Europe and propelled the search for new colonies with unfelled timber to exploit, and later coal and oil to burn. Their work has involved examining the court records of dozens of local vicinities across Germany, documenting when and under what conditions peasants received the maximum punishment possible for chopping down trees that were not their own. Paul Warde, ‘Fear of Wood Shortage and the Reality of the Woodland in Europe, c. 1450–1850’, History Workshop Journal 62 (2006), 28–57; Warde, Ecology, Economy and State Formation in Early Modern Germany (Cambridge, 2006). More generally, see Astrid Kander, Paolo Manamina and Paul Warde, Power to the People: Energy in Europe over the Last Five Centuries (Princeton, NJ, 2014). Maybe Paul Warde has argued somewhere that the West has long been on a path to “environmental exhaustion” or that early modern Europe had survived an “ecological crisis of unprecedented scale”. And maybe he has elaborated at length somewhere on the “anarchy” in early modern Europe resulting from a “collapsing ecosystem”. But it’s not apparent in any of those sources cited by Guldi. Warde’s “Fear of Wood Shortage“ even ends by concluding “Europe, for all its late eighteenth-century problems, remained distant from any ecological frontier”. The point in “Fear of Wood Shortage” is that because of high transport costs and political divisions, the market for wood was highly fragmented in Germany and Europe in general before the 19th century, and there could be local scarcities even when there was no general scarcity at all. And there’s the question of whether the rhetoric of “scarcity” was used to justify the political allocation of wood to industrial uses like mining or ironworks. It’s strange that Guldi didn’t pick up on this because, after all, she complains all the time about the enclosures of the commons. And what does Warde describe other than an enclosure of woodland commons ? Nor does the historiography described by Warde indicate “historians of Germany had documented a crisis in wood”. Rather, he describes a tradition of debate between social-science types (including Marx), who argued that the “wood crisis” was manufactured for political reasons, and the forestry specialists and environmental historians who argued for the reality of such a crisis. In Ecology Warde tells us on pg 228, “historians have tended to rely upon anecdote and second-guessing regulations for at least the first half of the early modern period”, rather than direct documentation of any actual wood shortage. What chapter 4 of Ecology actually documents is that there were many different types of wood for different uses (fuel, building, etc. ), and local shortages of some kinds were real enough, especially during the Thirty Years’ War, whilst other kinds were abundant. By any reasonable reckoning, what Warde describes seems less an ecological problem than a problem of political and economic fragmentation in early modern Germany. 30 Kenneth Pomeranz, The Great Divergence: China, Europe, and the Making of the Modern World Economy (Princeton, NJ, 2000); Fredrik Albritton Jonsson, Enlightenment’s Frontier: The Scottish Highlands and the Origins of Environmentalism (New Haven, 2013). I don’t know Jonsson, but I do know the Pomeranz book quite well, and my reaction is total mystification. Class, race, wisdom of local peoples being overridden, rule by landlords the cause of environmental destruction ? None of that is in Pomeranz. Pomeranz has got a substantial comparison of Chinese versus European land markets and use practises in the 18th century (pp 70-80). And his overall point is that Chinese land markets, on balance, were more efficient than Europe’s. In the latter, ancient entails, hereditary tenancies, and the slow progress of enclosures (e.g., in France, Germany, Spain) compromised the operation of the market and the free alienability of land. Other improvements were also foregone because of European land laws. Both the draining of marshes and the irrigation of existing farm land in eighteenth-century France were greatly retarded by customary rules and legal procedures that made it almost impossible to buy off those threatened by such improvements—even where it would have been very profitable to do so. It took the Revolution to abolish the privileges and simplify the procedures involved. Got that ? If the western elites were complicit in something, it was in retarding the intensive exploitation of land. At least according to Pomeranz. Western Europe on the eve of the industrial revolution theoretically had a lot of slack in land, but customary and institutional barriers kept it underutilised. England was the great exception. In chapter 5, Pomeranz does advert, on the land that was open to intensive exploitation, to the severity of deforestation (particularly in Britain, France, the Low Countries, and the Mediterranean), plus soil depletion and erosion in most of Western Europe. But again, in his depiction, this seems a result of institutional restrictions on land use. Pomeranz’s bias in The Great Divergence is to argue as much as possible that China was as “Smithian” or “neoliberal” as any place in Europe. So obviously you’re not going to get the perspective of the Movimento dos Trabalhadores Sem Terra. I thought Guldi knew how to “interrogate” sources ? 56 Alberto Alesina, Paola Giuliano, and Nathan Nunn, ‘On the Origins of Gender Roles: Women and the Plough’, The Quarterly Journal of Economics 128 (2013), 469–530. Alesina et al. most assuredly do not argue that “modern gender roles have structured our genes”. (What does that even mean anyway ? The sentence would only make sense if the genes were doing the structuring.) The words “gene” or “genetic” never appear in the paper, and the authors define “cultural norms” as “slowly changing beliefs about appropriate actions in different situations”. So I’m sure the authors would be surprised to hear their paper has been described as supporting a form of genetic determinism. They simply argue that societies which traditionally practised hoe agriculture, as opposed to plough agriculture, do better on metrics of gender equality. The paper also examines the persistence of gender attitudes amongst second-generation immigrants from plough and hoe cultures, and find that the attitudes persist only partially. So the paper, as the authors present it, does not even support the characterisation that anyone is “locked into [their] history” even culturally once they move. Obviously I could not look at all the notes. But I’m sure there would be more “peculiar” references if one were to look further. By the way, given all of the above, I find it a minor miracle that Guldi did not think Elinor Ostrom was a strong partisan of the tragedy of the commons, as a opposed to a critic. Edit 18 March 2015: I have just learnt that at least seven of the notes in both the HTML and PDF versions of The History Manifesto have been altered in order to eliminate or modify references highlighted above. Where appropriate I have linked to screenshots of the original references from the originally published PDF version. Edit 23 March 2015: Deborah Cohen and Peter Mandler have issued a statement to the same effect. Also, I’ve compiled a list of the changes I know about in a PDF document. Edit 30 March 2015: Cambridge University Press has posted a revision notice for The History Manifesto. This entry was posted in History Manifesto, Industrial Revolution, Inequality and tagged critique of the History Manifesto, David R. Armitage, History Manifesto, Jo Guldi. Bookmark the permalink. To point out the problems with referencing in the Manifesto is only right. However, to turn this post into an attack on Guldi, not both authors, is completely unwarranted given that it is based on an assumption. Without categorical confirmation of who wrote which poet ions of the book, this post is implicitly sexist in inscribing so many errors to Guldi alone and placing the Harvard male academic as above arrow. ‘which portions’ and ‘above error’. My apologies for the typos created by autocorrect. The above comment reminds me of a similar episode of SJW-oring, but ironically inverted in the sense that the critique mostly mentioned the male author. The real reason for that there as I suspect is the case here is that is more efficient to write one name as opposed to two, and it just so happens that Guldi’s name appears first in the title of the work. But hey, if there’s one thing modern academia is missing, it’s more “wah-wah sexism” whining. Armitage, the intellectual historian, is primary author, and it shows in the article. 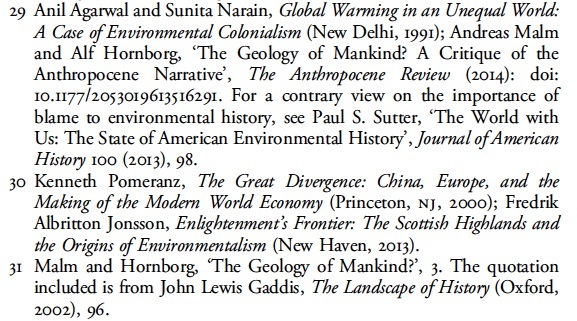 Except for the Landes reference, all the refs in the book I criticised were absent in the article and had to do with evonomic/social history and environmental history. What does Guldi specialise in ? Modern British social history and the international land movement.